Sometimes I’d feel arms around my waist and I’d look down to see Kenka smiling up at me. Yells and screams shatter the morning air as campers emerge from their six a.m. polar plunge at Camp Polaris, a small Adventist mission camp in southwest Alaska. Their teeth chatter and their lips are blue, but they are emphatically not cold. They’ve waited an entire year to dive into this icy water again, and only the wafting scent of pancakes can coax them out now. “Kenka used to love the polar plunge,” says counselor Katie Purvis, with a wistful smile. “It feels so weird not to have her here. I can still see her running down the beach, you know? Katie’s pool-blue eyes fill with tears, and I wonder whether it was a mistake to ask about Kenka. She, like all the camp staff, is trying to grieve the sixteen-year-old girl’s death privately and make the campers’ week as happy as possible. So, I keep asking questions, and the staff keeps sharing memories. And over the next few days, their memories, like brushstrokes, paint a picture so that I too can begin to see the beauty of Kenka Active. 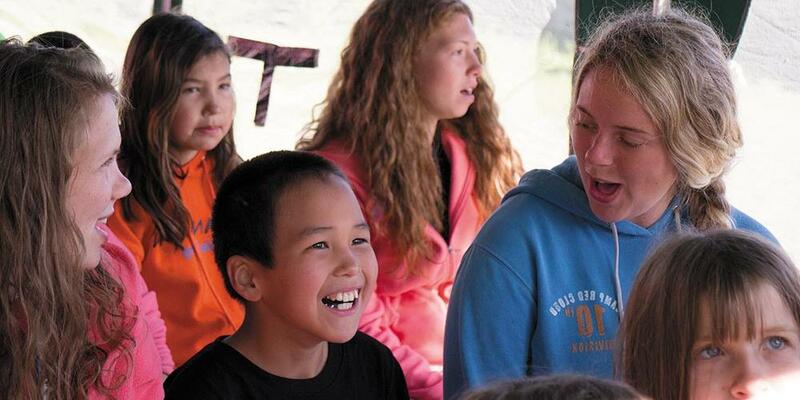 Kenka, like many children in the towns of Aleknagik and Dillingham, attended Camp Polaris each summer. It was her favorite place to be, whether she was zooming around the lake on a kneeboard or creating roses out of frosting to decorate her first cake. It was also where her love for Jesus blossomed. Kenka liked to sing the worship songs and especially enjoyed listening to the staff play their guitars. When she expressed a desire to learn how to play, program director Boyde Hosey taught her. When she learned quickly, he gave her a guitar of her own. Debbie and Ken Reiswig have served as caretakers for Camp Polaris since 1994. They have formed strong bonds with the people in their community and are especially close to Kenka’s family. It didn’t take Kenka long to wrap her adoring elder brothers around her finger. They spent hours with her, hiking and swimming and teaching her how to fish. On one occasion, Kenka’s mother asked her to wash the dishes. Kenka got a twinkle in her eye and went outside to chop wood. After a while she came back in the house and announced that she had chopped wood—get someone else to wash the dishes! On Friday evening, the children gathered in the lodge at Camp Polaris for a special time of remembering Kenka. At the mention of Kenka’s name, her brothers, Lodi and Jeshae, began to cry. Soon all of our eyes were filled with tears. “She always made me laugh,” said one girl, breaking the silence. She told a funny story about Kenka, and then the other campers began to share. “She always had a smile on her face,” another added. After everyone had had an opportunity to comment, Chaplain Ellison shared Jesus’ promise to take those who love Him to live with Him forever. When he asked, “How many of you want to go to heaven and see Kenka again someday?” the lodge became a sea of waving hands. That night in Katie’s cabin, her campers had many questions. “What will life be like in heaven?” one girl asked. “Does the Bible say what heaven looks like?” asked another. Sitting on the floor with the girls, Katie shared several texts about heaven from her Bible. “I really want to be there,” said one camper. “Me too,” chimed in others. I wish I could have met Kenka. But the effect she and the camp she loved had on those I did meet touched me deeply. Because of them, children in a little fishing village in Alaska now know that Jesus loves them and is coming soon to take them home.